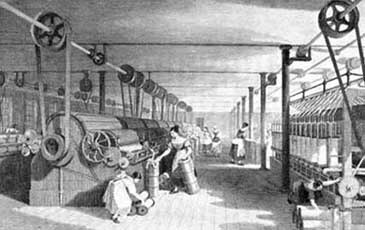 It's generally agreed that the beginning of the industrial revolution started around 1760. Of course this depends on which reference is used. Ultimately, the drive to automate repetitive tasks started about when humans did. The "end" of the industrial revolution supposedly occurred about 100 years ago, though looking around today it hardly seems over. Today's level of industry and automation easily surpasses the dreams of early inventors. Inventors that, through the course of the 1700 and 1800's, brought advancements in machine technology and primed the creation of today's motion control industry. Early factory automation powered by belt and pulley systems. Motion control was non-existent and automation took the form of crude motors with belt and pulley drive trains. Powering an industrial building required a large water wheel outside or steam engine sitting in the basement. Usually a vertical drive train ran through the building from a steam engine in the basement to transmit mechanical power to each floor. At the floor level, a transmission converted power from the vertical drive train to a horizontal train that spanned the floor. Each department needing mechanical power tapped off the main line with a clutch mechanism. Sewing machine operators, for example, used a foot clutch to engage individual sewing machines to the power source. Engineers used the momentum of the late 1800's to bring electrical powered appliances to consumers. Edison's invention of the DC generator in the 1870's, public electricity and Tesla's AC motor in the 1880's, and the first electric hand drill in the 1890's gave way to electric washing machines and refrigerators around 1915. By this time Henry Ford had only recently realized a mobile production line where parts were standardized and factory efficiency soared. It was 1927 when Harold Black revolutionized communications with the concept of negative feedback in amplifiers. He was not the first to close a feedback loop though, because thermostats and furnaces had been regulating room temperature using feedback since the late 1800's. James Watt had worked on a mechanical feedback loop for his steam engine even before that. In story like fashion Harold Black had an epiphany on the way home from work one evening that applying a portion of an amplifiers output back into the input could substantially reduce signal distortion. Soon after Black's discovery, the first pneumatic motion control products arrived in the 1930's employing feedback for closed loop control. Harold Blacks original equations and diagrams describing negative feedback. Jotted down while riding the ferry to work. At this point, proportional-integral-derivative (PID) control was just surfacing as a conscious thought for most of the world. J.C Maxwell wrote a detailed mathematical analysis about PID in 1886, but it took about 50 years for products intentionally using PID tuning to arrive. The 40's and 50's marked the beginning of major strides in PID control. People finally recognized the importance of mathematical analysis and began developing control theory as a science. This was, of coarse, a very crude period of PID control. During the 50's, 60's and 70's, space flight and war helped spur the effort to develop optimized control algorithms. Solid-state devices and motor technology developed in the 60's to a point where PID control migrated into microcontrollers. Various improvements and optimizations continued until the late1970's when pulse width modulation (PWM) switching technology was introduced along with brushless permanent magnet motors. Motion control hasn't been the same since. During the last 20 years DSP, networking, and PWM switching technology have created an exponential increase in the use of closed loop motion control. PWM switching technology in amplifiers and power supplies made high efficiency, low heat power transmission possible. In just a few years, the size of a 2kW motor amplifier shrank from 100 pounds or more, to something that could be hand carried and bolted to a panel. In about 1990, DSP based motion control products started allowing sophisticated motion profiling and digital communication via serial networks. Such rapid changes in technology created a breakdown in standardizing motion control products. Network protocols such as Profibus (1989), DeviceNet (1994), and Smart Distributed Systems (1994), for example, attempted to take over the Control Area Network (CAN) market. One of the first networks, CAN, had been around since the mid 80's for automotive communication; it proved so versatile that it moved into the automation world in the 90's. Sercos came out in the early 90's using it's own hardware layer with fiber optic transmission lines while other proprietary networks arrived using an RS-485 hardware layer. Today the industry is far from standardized with an incredible availability in smart motion controller cards, servo amplifiers, motors, feedback devices and mechanical linkages. See "Motion Control Today" for a brief update on all of these options. Today there are many choices when putting a system together. Theoretically, the ideal system can be created by matching the best network, to the best controller, to the best servo drive, to the best motor and feedback. However, this dream is often difficult to implement because of interoperability issues. The reason is manufacturers of motion control equipment tend to develop their own proprietary systems that limit users to hardware produced by that manufacturer. Many times users find packaged solutions adequate for the job but oftentimes the user isn't getting the best performance possible. There is a trade-off between convenience and performance. Motion control system designers are increasingly demanding the availability of open standard solutions. Systems based on open standards will allow engineers to shop around for the components that meet their cost/performance needs and make second sourcing of critical components more realistic. CANopen was developed specifically for motion control and is often the network of choice because of its proven reliability in motion control and it is an open standard. Ethernet Power Link (EPL) is an Ethernet extension of CANopen that takes advantage of the high connectivity rates of Ethernet while maintaining the robust communication capabilities of CANopen. Open network standards such as these will help boost motion control system development to the next level of performance and convenience. The future of motion control will see better integration of system components and easier integration and programming. Motion controllers provide smarts to a machine's movement. They can be stand-alone or PCI cards that mount directly into a PC. Features such as trajectory-generation, S-curve profiling, compensation, low pass filters, notch filters and other algorithms make tightly controlled profiles easier than ever to achieve. Motion controllers can control single or multi-axis machines with either distributed or centralized networks. CAN and 100Base-T are the most common networking layers. These networking solutions are popular, but standard analog and Pulse/Direction command sources still hold a large piece of the market and are available on virtually every motion controller card. Motion controllers usually interface to an amplifier or "servo driver" that sits between the motor and the controller. The defining line between servo drives and motion controllers has begun to blur because servo drives are getting functionality that previously only motion controllers had. Sophisticated control loops reside in an increasing number of drives. This is good because it gives the motion controller headroom for higher-level algorithms. While analog drives comprise a large percentage of servo systems, digital drives are becoming more attractive because of programmable I/O and many software configurable features. One of the many bonuses to going digital is that the entire functionality of a digital servo drive can be changed with a simple firmware download, thus making field upgrades with new features fast and easy. Motors come in any size and shape with various control schemes. Explosion proof motors are popular in volatile environments and frameless motors make tight integration possible. The pharmaceutical and beverage industries use "wash down" motors for specific applications where the motor will be pressure washed periodically. Motor manufacturers can create motors with any kind of specification including size, weight, shape, torque rating, speed rating, motor constant and more. There are many types of motors to choose from, including: stepper motors, single and three phase ac induction motors, permanent magnet brushless motors, permanent magnet brushed motors, and linear brushless motors. In order to control the position or velocity of one of these motors, appropriate feedback devices are required. There are a few standard feedback devices that work for most applications. Among these are tachometers, incremental encoders, absolute encoders, resolvers, analog potentiometers and Halls. While all the mentioned devices use either digital TTL level pulse trains or analog signals, newer absolute feedback devices are capable of serial communication. Instead of simply reading a voltage or counting pulses, the drive or controller must actively communicate with the feedback device to receive digital indication of the rotor position. With 1Vpp sinusoidal encoders, some high precision applications are using techniques to achieve resolutions of over 4-million counts/revolution! However, achievable resolution at the load depends largely on mechanical linkages and advanced feedback schemes such as dual-loop feedback.